Allows you to send the generated export file of the applications by email. The sending of this email may be using SMTP or through integrations with Mandrill and SES. We must configure how to send the email or select an API already configured in Tools> API. Click Here and see how to configure. SMTP is the standard protocol for sending e-mails over the Internet, each provider has its own SMTP. API: Allows you to select an API that is already configured in Tools> API or set a new one here by selecting - custom -. In this case you will see some options according to the selected Gateway. SMTP Server: SMTP server address for the provider being used. User SMTP: SMTP server user. Enter SMTP: SMTP server user password. Protocol SMTP: Defines the security protocol that will be used. If the value is omitted, the Scriptcase defaults to the default value. E-mail: Sets the origin email, which will send the emails. Name: Name that will be displayed in the sent email. Mandrill is a transactional email API for MailChimp users, ideal for sending data-driven emails. API KEY: Enter the key you obtained when setting up your API. Amazon Simple Email Service (Amazon SES) is an email sending service designed to assist in sending marketing emails, notifications, and transactional messages. API Secret: Enter the secret access key of your account. Region: Amazon SES has endpoints in several regions, in order to reduce network latency, inform the region of the endpoint closest to your application. See the regions. In these settings, we define the settings of the email sending interface when exporting, and we can define a default email subject and body. To: Enter the default destination email. Use Copy (CC): Defines whether or not to display the ‘copy’ field within the export options. No: There will be no possibility to send email with copies. 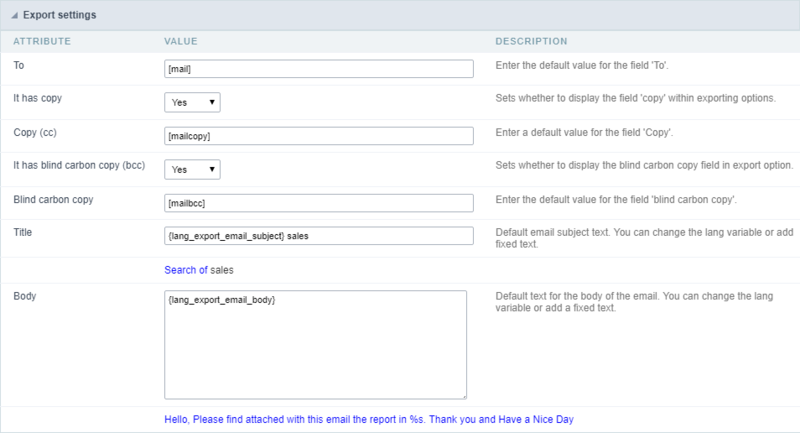 Yes: The field will be displayed within the export options and we can define a default email for copying. The end user can view this email. Hidden: The field will not be displayed within export options and we can set a default email for copying. Copy (CC): Enter the default e-mail for the copy field. This option can also be empty or you can use a global variable containing an email list. Using Hidden Copy (BCC): Sets whether or not to display the ‘hidden copy’ field within the export options. Copy (BCC): Enter the default e-mail for the hidden copy field. This option can also be empty or you can use a global variable containing an email list. Color: Default body text for the email. You can change the lang variable or add fixed text. The text can be changed in the body field within the export options.